Coral reef resilience refers to a reef ecosystem’s ability to recover from a disturbance and recover towards a coral-rich state, and/or to maintain morphological diversity as opposed to shifting to an algal-dominated state or a single coral morphology. 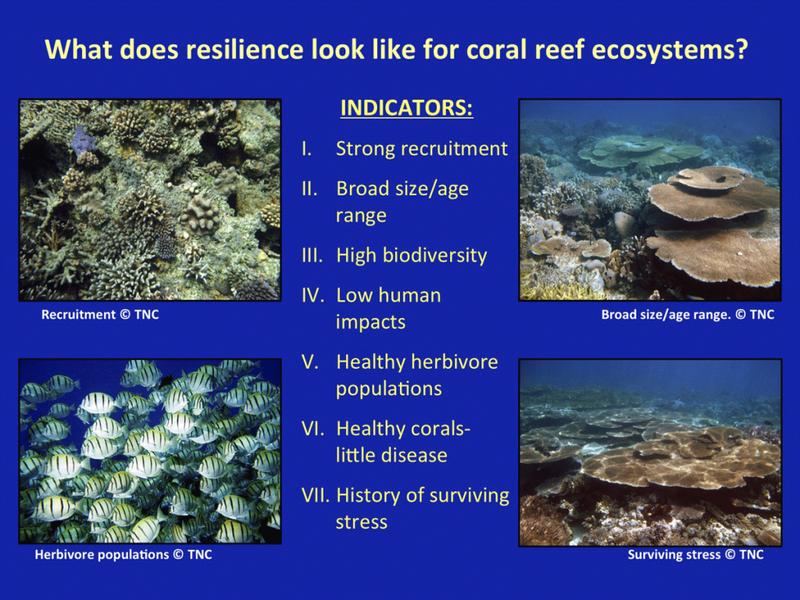 As a coral reef manager, it is helpful to understand important indicators that support coral reef resilience. Resilience is more than resisting or being able to recover from a major disturbance, such as surviving bleaching, or resisting bleaching. For a community to be resilient, it must also be able to continue to thrive, reproduce, and compete for space and resources. Strong coral recruitment — Indicates strong connectivity to healthy source reefs (although the reef may be self-seeding) and good conditions for larval settlement and growth (available substrate, good water quality). Low human impacts — Indicates a lower level of local stressors that weaken the ‘immune system’ of coral reefs; low human impacts may mean corals will be able to resist and recover from major stress events more effectively. Healthy herbivore populations — Indicates a high potential for coral reefs to recover from major stress events as herbivores graze down algae and thus prepare the substrate for larval settlement, which supports coral reef recovery following disturbance.